The Golf Show at Turning Stone presented by Pepsi, a three-day golf event, will feature all of the top manufacturers including Titleist, TaylorMade and Callaway. Golfers will have an opportunity to participate in a show-long demo day, education sessions, daily contests and more. The show will open on Friday, February 16 and will run through Sunday, February 18. Exhibitor opportunities are still available. Turning Stone announced it will host its first-ever Golf Show for guests at its award-winning Golf Dome and Sportsplex. The Northeast’s leading year-round golf destination will host an exciting three-day golf show beginning on Friday, February 16 through Sunday, February 18. The Golf Show at Turning Stone presented by Pepsi will feature all of the sports top golf club manufacturers including Titleist, TaylorMade, Callaway, Ping, Cobra and more, along with apparel, accessory and other golf vendors. Over the course of the three days, guests will enjoy a packed schedule of a show-long demo day, including the latest products from top golf manufacturers and hourly education sessions, such as club fittings and new golf technology. Additionally, the show will also include daily Drive, Chip and Putt contests with a range of prizes and more than 35 exhibitors. Friday, February 16: 1:00 p.m. to 6:00 p.m.
Saturday, February 17: 10:00 a.m. to 7:00 p.m.
Sunday, February 18: 10:00 a.m. to 4:00 p.m.
A unique 365-day a year golf destination, Turning Stone recently introduced a new indoor short game area within the Sportsplex, the first of its kind in Upstate New York, adding to an already impressive indoor facility. The new short game area features three greens, fairway areas, short rough, long rough, multiple putting surfaces, fringe and two bunker options, and elevation changes of almost eight feet, allowing players to practice hitting on side hill, uphill and downhill lies. With a dynamic, fully-functional practice area inside the Golf Dome and Sportsplex, Turning Stone’s expert staff can now provide short game instruction 365 days a year. 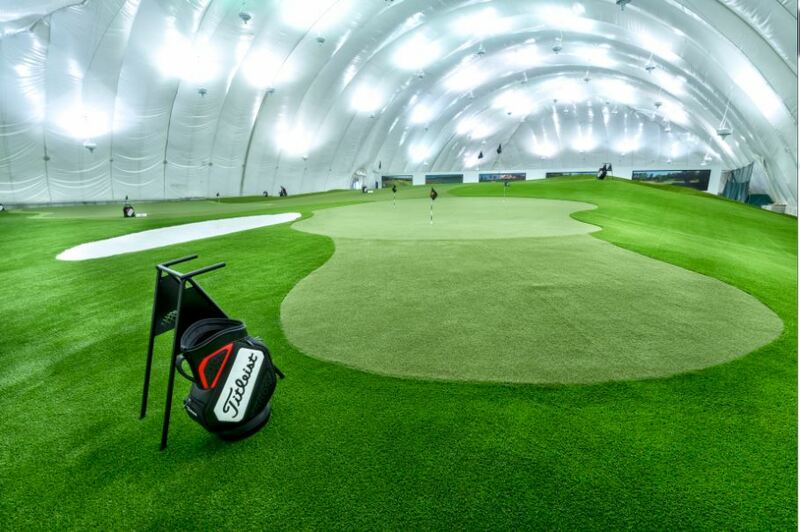 Turning Stone’s indoor Golf Dome also features forty hitting stations, the TaylorMade Tuned Performance Center and a 5,000 square foot Golf Superstore that carries the latest and greatest golf apparel and equipment. Players can also schedule one-on-one instruction with any of Turning Stone’s golf professionals or take part in group practice sessions at the resort’s Golf Academy to fine-tune skills and techniques.